without mark-ups: direct pricing from the manufacturer to your door. 2002) who believed the #1 health problem in America is our digestion. headaches! 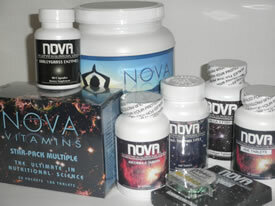 Try the products and see the difference Nova’s make. vegetable doesn’t guarantee that it has been grown on mineral rich soil. I use juices much the same as I use supplements –to get specific nutrients into the body fast so they can get to the cells and restore proper function and balance.” Feed your cells! and busy lifestyles that also contribute to voids in our nutrient supply. for proper absorption. Save money on expensive products everyday! help your family and friends save money too. Nova’s little known “coop” that saves you 30 – 50% everyday!